The Law Enforcement United is a group of Law Enforcement Officers, Survivors, and Civilian supporters who have made it their mission to honor the fallen and remember the survivors. Law Enforcement United is founded upon and committed to honoring officers who have died in the line of duty, and ensuring that their surviving family is supported and not forgotten. Their fundraising efforts support The Road to Hope, Concerns of Police Survivors, The Officer Down Memorial Page, and Spirit of Blue Foundation. 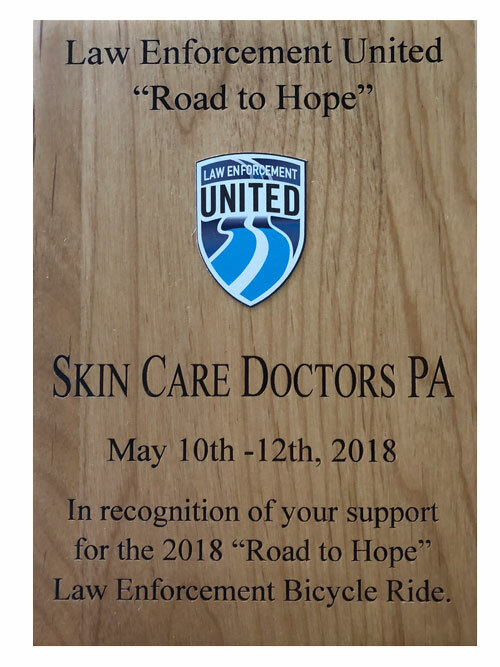 ​This past May, Dr. Michael Ebertz and Skin Care Doctors, P.A., proudly supported the 2018 “Road to Hope” Law Enforcement Bicycle Ride. Established in 2009, the annual Road to Hope Memorial Bicycle Ride leaves from Chesapeake, VA to Washington, D.C. on May 10-12th. The Road To Hope is a physically challenging and demanding event for both riders and support. Riders need to train and prepare for 250+ miles over three days. They have hills, and ride in a group formation. They are up early and end late. They pitch in and help each other out. They clean up their messes. They rely on jurisdictions to provide them with rest stops, road escorts, blocks and memorial stops so they want to be respectful and thankful for them. We are a group of Law Enforcement, Survivors, and Civilian supporters who have made it our mission to honor the fallen and remember the survivors. We are 100% volunteer driven organization. We all have full time jobs and families just like you. Law Enforcement United is our passion, and we hope it becomes yours too. To learn more about the Law Enforcement United “Road to Hope” please visit https://www.leunited.org/the-road-to-hope . https://www.skincaredrs.com/wp-content/uploads/2018/08/LEO-Road-to-hope-plaque500.jpg 667 500 webadmin https://www.skincaredrs.com/wp-content/uploads/2017/03/logo-500.png webadmin2018-08-28 12:54:332018-08-28 13:12:29Law Enforcement United "Road to Hope"
JAMESTOWN, North Dakota, August 16, 2018 — Dr. Michael Ebertz, a founding partner of Skin Care Doctors, P.A., is helping, for the 13th consecutive year, with the St. John’s Academy HOPE Dinner and Auction Fundraiser. Taking place on October 13, 2018, the HOPE Dinner and Auction is an annual event where the school raises money for the education of the 240 young students who attend St. John’s Academy. Dinner begins at 6 PM on Saturday, October 13th. A prayer will be held before the meal, which is catered by the Knights of Columbus. Tickets for the event are available at $75 for each person. There are four tiers of sponsorship – Saint, Angel, Patron, and Friend level – with donations amounts of $1,250, $1,000, $750 and $600. For the 22nd year, he is involved with the “John and Glory Ebertz Memorial Scholarship” that was created in honor of his late father who passed away from leukemia. The scholarship helps students achieve their academic goals at St. John’s Academy and beyond. Over 32 students have benefited from the scholarship since 1997. The John and Glory Ebertz Memorial Scholarships were established in 1997 by Dr. Michael Ebertz (Twin Cities Medicare Dermatologist) and Father Charles Richard Rudd after the passing of Michael’s father, John, from leukemia. The scholarship fund memorializes two of our most beloved St. James Basilica alumni who exemplified the values, achievement and success they seek to instill in all of their students. These scholarships were expanded in 2007 to provide full tuition to Catholic students and support each recipient’s spiritual and intellectual growth. Since then, 32 students have received this honor. The Ebertz scholarships provide financial relief for recipients and their families who struggle to pay tuition but are committed to ensuring their children have the opportunity to learn about the life and teachings of Jesus Christ every day. Families who have received this financial assistance are also able to save for the future investment in tuition and to develop their child’s other talents, such as athletics or arts. Additionally, recipients of the Ebertz scholarships are able to realize other unique benefits of an Academy education. St. John’s Academy offers a rigorous curriculum that prepares students for the academic and social challenges of junior high and upper school. Similarly, their faith-based education provides a spiritual foundation for students to learn and grow into strong leaders and active community members. The integration of faith in their classrooms fosters lifelong friendships and positions students for future success. Dr. Michael Ebertz hopes to inspire students to lead lives imbued with meaning and encourage young people to achieve their full potential – just as Glory and John did. Glory and John were both active students at St. John’s Academy involved in sports, student government and other extracurricular activities. Glory earned the nickname “SJA Florence Nightingale,” given to her by her classmates. She was well-known at school for her good grades and first aid skills. She graduated as Salutatorian in 1945. She was also a cheerleader and the manager for the class play. Likewise, John Ebertz graduated from SJA in 1948 as Senior Class President. John also showed leadership on the field as a member of the football team. Glory and John both held a deep love and commitment for St. John’s Academy. 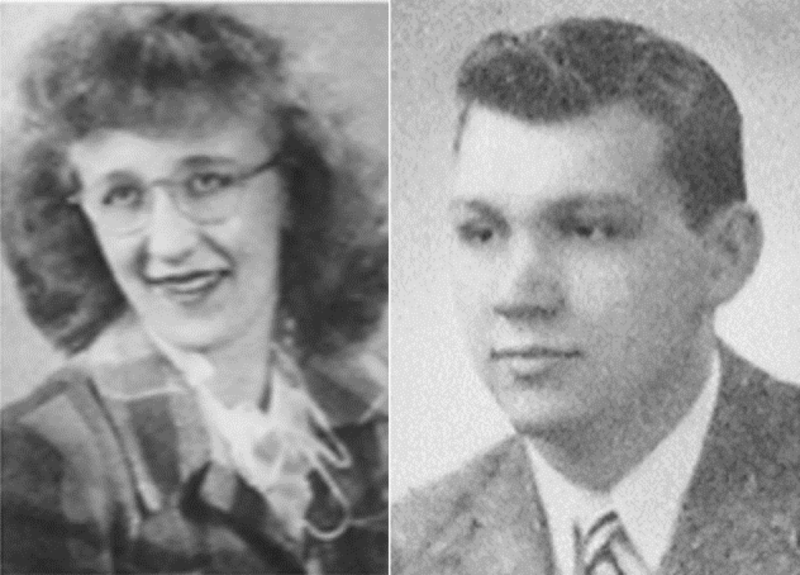 Throughout their lives, the couple maintained a close affiliation with the school and participated in annual fundraisers and events for St. John’s Academy and the Foundation for the Advancement of Christian Education (F.A.C.E.). Today, Dr. Ebertz continues support these and other scholarships named in honor of two exceptional alumni. John and Glory exemplified the kindness, generosity and love that is taught in our classrooms every day.